﻿ Shanghai Tanimura Chemical Co., Ltd.
1. 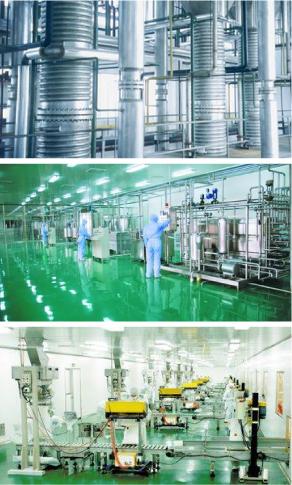 The purified water system adopts the technology of Level 1 reverse osmosis plus EDI (filling ion exchange resin electrodialysis device), which has reached the advanced level of the similar foreign products, can meet the water requirements for the infusion production in full compliance with 2000 USP, GMP and FDA’s requirements and regulations for pharmaceutical water. The system operates by adopting the distributed control system for the decentralized control and centralized monitoring, for which the operating station comprises of the industrial PLC control and block control, forming a reliable distributed control system for automatic operation and monitoring control. 2. Featuring the separate operation of the pressure reduction system and temperature reduction system, the steam conditioning system adopts Y-W series temperature and pressure reducing devices. It can also play a good effect in worse conditions. When operating, it features large scope of conditioning, steady action, good effect, high sensibility and precision. It adopts a real-time intelligent digital regulator for control. The entire technology enjoys a high level at home. 3. There is only one 10KVA dedicated line for the power supply system and the 35KVA dedicated line is about to launch. The entire system also adopts the operation of distributed remote operation and control. It is also equipped with a set of Rolls-Royce P=1250KVA diesel generator units. 4. The company’s cooling system is collectively managed by the refrigeration station. For deep cooling, a piston machine is equipped while the air-conditioning water (7℃ water) adopts two advanced single-screw units produced by Japan’s Daikin. The unit adopts the PLC intelligent control, boasting simple operation and high efficiency. Currently, the operation and record of water, electricity and steam are managed by computers. The control center is the brain of the overall energy system, which greatly promotes the management upgrading and improves labor productivity. The Quality Assurance Department of our cooperative factory established in 2003, is directly under the leadership of the company’s General Manager who is responsible for all work related to quality management. The Quality Assurance Department can be divided into three functional departments: Quality Assurance Department QA, Quality Assurance Department QC and Measurement, which exercise the functions of quality supervision, management and quality inspection, maintain and calibrate the company’s measuring instruments respectively. The Quality Assurance Department QA is responsible for establishing and perfecting the company’s quality supervision system and monitoring the whole process, including the procurement of materials, releasing of finished products and sales. It implements the management of the overall quality system by means of site inspection tour, periodic inspection and regular quality reports, and organizes GMP training regularly. The Quality Assurance Department QC is responsible for monitoring the inspection and environmental conditions of raw & auxiliary materials used for production, finished products, intermediates and process water. The Measurement is responsible for the whole process management from the selection to update or scrapping, maintenance and calibration of all measuring instruments in each department. The Quality Assurance Department strictly checks all links from the procurements of raw materials, production process until the warehousing of finished products and sales releasing since its establishment. 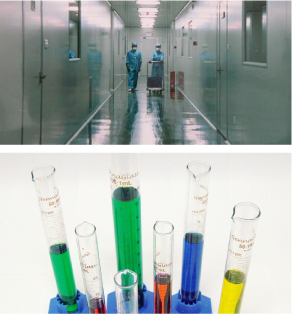 All processes are performed in strict accordance with the GMP specification. Regarding GMP standards and FDA certification as the breakthrough point, the company is in full line with the international practice by adhering to the “Sense of the Times, High Starting Point and High Standards” for purpose. With sophisticated quality testing equipment and well trained testers, the product quality control is reliably assured. 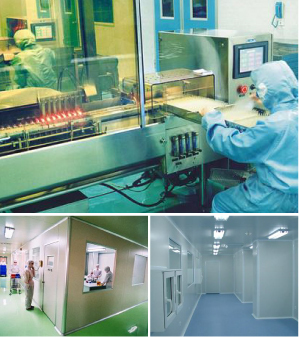 The product quality standards meet the requirements of USP, BP, EP, JP and CP. In over 9 years from the company’s establishment until now, it accepted the GPM certification twice, in which 17 crude drug products passed GMP certification. 1 June 2004 Ciprofloxacin hydrochloride, fursultiamine, tolmetin sodium, atropine sulfate, racanisodamine, atropine methyl bromide, thiamphenicol, amiloride hydrochloride, didanosine, spironolactone, etofylline clofibrate, fluconazole and furazolidone passed GMP certification. 2 June 2005 Povidone iodine, cetylpyridinium chloride, sodium fluorescein and N (2)-L-alanyl-L-glutamine passed GMP certification. The Product Development Department Group of the Shanghai Tanimura Industry Co., Ltd. was established in June 2004. The company mainly focuses on the development of crude drugs as well as pharmaceutical intermediates and chemical products. With the help of modern drugs, a series of novel and efficient products, featuring originality, large market differences, strong competitiveness and high barriers to access to the market and technology, are developed on the product transmission technology platform. Our products involve medicine and new materials (organic silicone). The laboratory of the Product Development Department, covering an area of over 1,000 m2, is provided with advance chemical synthesis equipment and many advanced imported analyzer equipment, such as high performance liquid chromatography (HPLC), gas chromatography (GC), infrared ray (IR), ultraviolet spectrophotometer (UV) and Olympus optical microscope with strong analysis and testing capacities. The Product Development Department currently has more than 30 staff specialized in the research of new products, with 4 doctor’s and 4 master’s degree staff, and over 95% have intermediate and senior titles and mostly are professional technicians with the practical capacity who engage in the research and management of new product projects, and independently undertake the topic of major new products for many years. The center will continue to expand the research team and enhance the capacity of high-tech competition. In addition, our company strives to create an excellent environment for scientific research staff so as to increase researchers’ confidence and work enthusiasm for the project research and development. The Product Development Department, focusing on strengthening the external cooperation, has established a long-term close cooperation relationship with many advanced research institutes, such as Shanghai Jiaotong University, Zhejiang University, Lanzhou University and Shanghai Institute of Organic Chemistry of Chinese Academy of Sciences.